Deaf people who communicate through sign language are better than their hearing counterparts who don’t understand sign language at spotting and reading body language, according to a new study from the University of California. The study, which was published in the journal Cognition, was funded by the National Science Foundation, along with the National Institutes of Health. The results may mean that people who are deaf and rely upon visually-based communication are especially good at observing small cues in movement or expressions that people who tend to rely upon their ears for communication often overlook. This heightened ability to read non-verbal cues could be a distinct plus for people who work at certain jobs, such as airport screeners. According to David Corina, a professor at UC Davis who led the study, the new research lends credence to what many people have been saying for years. Both deaf and hearing participants were shown video clips of people using American Sign Language or making non-verbal gestures that were not signs. The investigators were not surprised that the deaf participants were quicker than the hearing participants at interpreting the sign language they saw in the clips. However, the deaf participants also picked up on the non-verbal gestures that appeared in the clips significantly faster than hearing participants. Corina concluded from his research that human communication can be just as effective in other forms besides speech. Because signers express themselves through non-verbal gestures and receive communication through visual means, they become more adept at recognizing body language and gestures, as well. 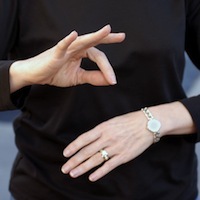 Further, Corina believes the new study adds support to the theory that sign language uses a modification of the same system that all humans use to interpret non-verbal communication. Older theories had explored whether communication through signs worked through a completely different system. Fascinating – Would there be a difference in adult (hearing) learners of sign vs. deaf/native signers? Would a hearing individual’s ability to interpret non-verbal communication improve if they were to learn sign as a second language?